Purchase / Get a Quote! Virtualsets.com is focused solely on virtual sets. We design original sets and license the virtual sets in our existing library. With our many years of experience in traditional set design, we believe that we design the most realistic virtual sets in the industry. We also serve as consultants and resellers for various hardware systems and configurations. Since we work with all of the best and most popular virtual set systems, we are free to objectively present our clients with the very best overall solution for their virtual production needs. Our current virtual set clients range from major broadcast and cable networks, to local affiliates, to commercials, to product launches, and corporate videos and webcast presentations. 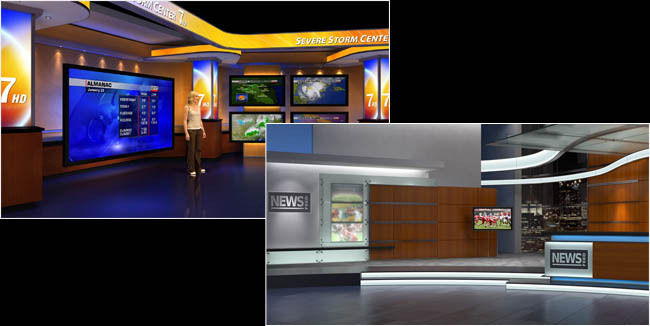 Our set designs range from broadcast news rooms, to talk shows, to dramas, to virtual locations. We have virtual set designs and hardware systems for the range of productions and budgets. 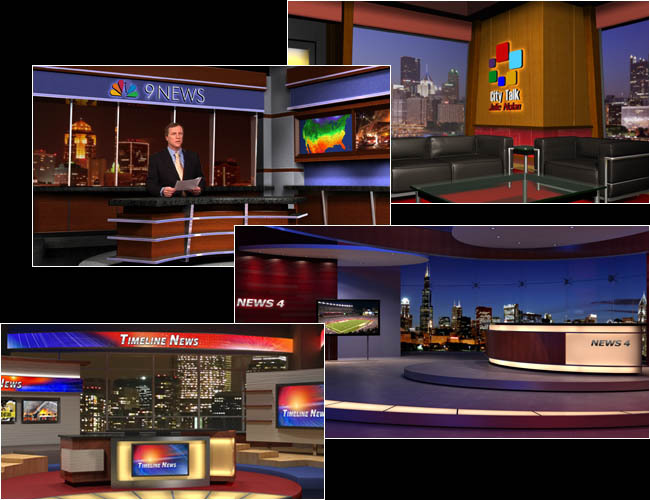 All of our virtual set designs are now compatible with TriCaster, Brainstorm, Orad, Vizrt, Hybrid, XPression, and nearly all editing software (Final Cut Pro, Avid, After Effects, Premiere, etc). We encourage you to take a look at a selection of our virtual set designs, by clicking on any of the images on this page. Then, contact us if we can answer any of your questions or help you in any way. and consulting services for virtual sets. All content on this site ©1990-2019 Virtualsets.com, Inc. All rights reserved.